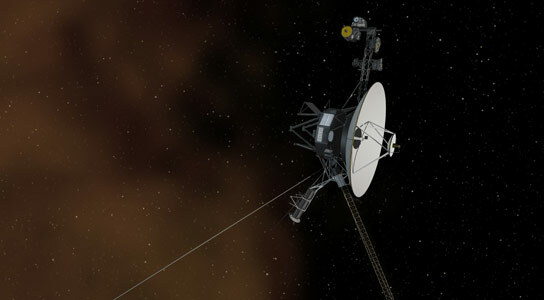 The Voyager message is carried by a phonograph record, a 12-inch gold-plated copper disk containing sounds and images selected to portray the diversity of life and culture on Earth. The contents of the record were selected by a committee chaired by Carl Sagan of Cornell University. Dr. Sagan and his associates assembled 115 images and a variety of natural sounds, such as those made by surf, wind and thunder, birds, whales, and other animals. To this they added musical selections from different cultures and eras, and spoken greetings from Earth-people in fifty-five languages, and printed messages from President Carter and U.N. Secretary General Waldheim. Each record is encased in a protective aluminium jacket, together with a cartridge and a needle. Instructions, in symbolic language, explain the origin of the spacecraft and indicate how the record is to be played. The 115 images are encoded in analog form. The remainder of the record is in audio, designed to be played at 16-2/3 revolutions per minute. It contains the spoken greetings, beginning with Akkadian, which was spoken in Sumer about six thousand years ago, and ending with Wu, a modern Chinese dialect. Following the section on the sounds of Earth, there is an eclectic 90-minute selection of music, including both Eastern and Western classics and a variety of ethnic music. Now Voyager has left our solar system, it will be forty thousand years before it makes a close approach to any other planetary system. As Carl Sagan has noted, "The spacecraft will be encountered and the record played only if there are advanced spacefaring civilisations in interstellar space. But the launching of this bottle into the cosmic ocean says something very hopeful about life on this planet." 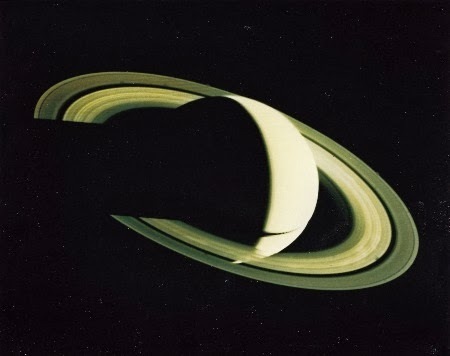 This picture was taken by Voyager 2 on 18th of September 1977. 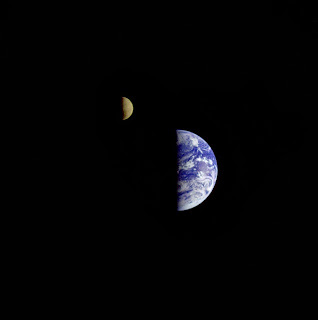 The image of a crescent earth was the first of its kind ever taken by a spacecraft. The Earth is many times brighter than the moon so the moon was artificially brightened so that both bodies would show clearly in the prints. At this point Voyager was 7.25 million miles from Earth. 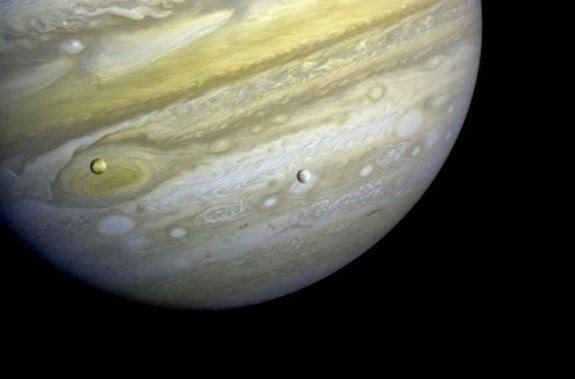 This stunning image of Jupiter captured by Voyager 1 shows its moons, Io on the left, and Europa on the right. This image captured by Voyager 2 shows Io. A closer image was taken showing Jupiter's Great Red Spot. Altogether the Voyagers' took over 33,000 pictures of Jupiter and its five major moons. Jupiter is the fifth planet from the sun and is a gas giant, the biggest planet in our solar system. It is more than twice the size of all the other planets combined, and if it was 80 times more massive, it would have become a star rather than a planet. 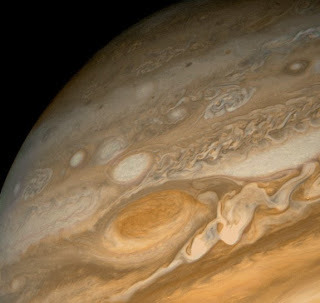 Jupiter is made up mostly of hydrogen and helium, with small amounts of methane, ammonia, hydrogen deuteride, ethane, water, ammonia ice aerosols, water ice aerosols and ammonia hydrosulfide aerosols. The most obvious feature of Jupiter is of course its Great Red Spot, a giant hurricane of gases swirling around constantly. At its widest, the Great Red Spot is three times the diameter of the Earth, and its edge spins counterclockwise around its centre at a speed of about 225 miles (360 kilometres) per hour. Its magnetic field is nearly 20,000 times stronger than Earth's magnetic field. Astronomers have been looking at this giant planet for more than 300 years, from the earth, but now we could get up close and personal with the aid of the Voyager spacecrafts. What we now understand about Jupiter is that important physical, geological, and atmospheric processes go on in the planet, its moons, and magnetosphere that were new to scientists. The biggest surprises came from Jupiter's many moons, one in particular, Io, the discovery of active volcanism on the surface. It appears that activity on Io affects the entire Jovian system. Io seems to be the primary source of matter that is apparent throughout the Jovian magnetosphere, (the region of space that surrounds the planet). Sulphur, oxygen, and sodium, erupted by Io's volcanoes and spurted off the surface by the impacting of high-energy particles, were detected at the outer edge of the magnetosphere. Particles of the same material are also present inside Io's orbit. For me, the most exciting moon is Europa, instantly recognisable by its cracked surface made of ice. Scientists believe that this moon may hold water underneath its cracked surface, and it is the movement of the water that causes the ice to crack. This might just be the place in our solar system, where life may have taken hold. The colourful image came from Voyager 2 during its close encounter on 9th July 1996. 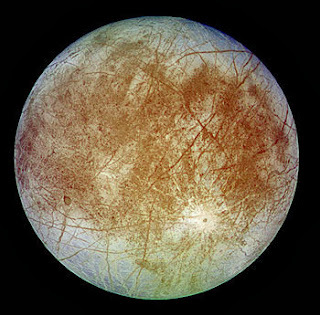 Voyager 2 took many detailed images of Europa. One scientist famously said, "the moon looked as smooth as a billiard ball." Continuing on their journey, by using the powerful gravity field of Jupiter, both spacecrafts hurled it selves on to Saturn. 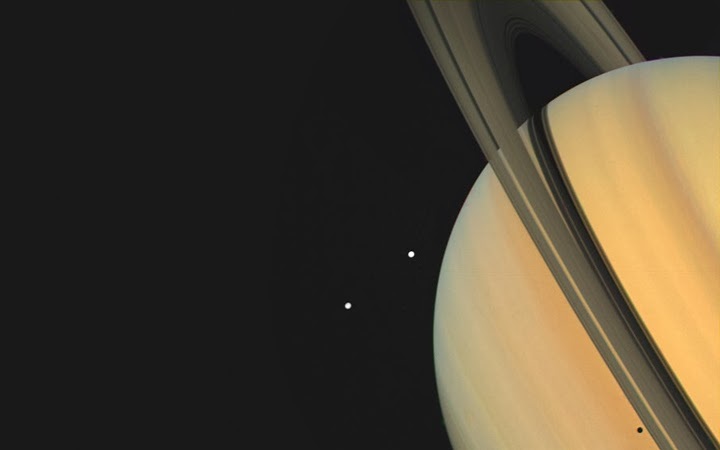 In this image of Saturn captured by Voyager 1, on the 3rd of November 1980, at a range of just under 8.1 million miles we see Saturn's moons Tethys and Dione. 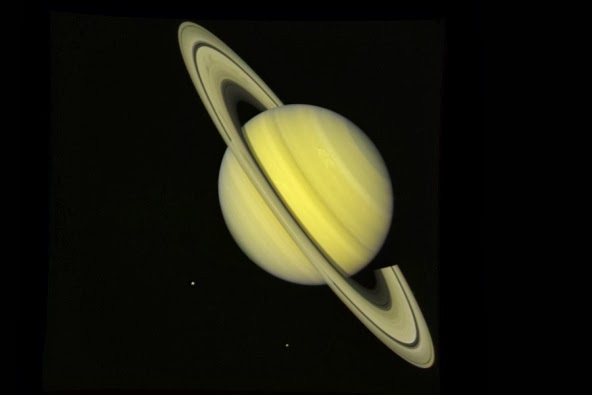 On leaving Saturn, Voyager 1 managed to snap this famous picture of the dark side of Saturn, unseen from the position of Earth. This true-colour image, captured by Voyager 2, on 21st of July 1981, also shows the moons Dione (small dot at left) and Rhea (lower right) near Saturn. What they have written on that disk is so terribly stupid! shows greeeaat ignorancy, that's all! I woudnot visit such people if i were alien!